Booking a hotel on the other side of the planet is a lot easier thanks to the Internet. But really, you still don’t know what you’re going to get until you step inside a room. And Lonely Planet guidebooks can only tell you so much. So I’m rating hotels in New Zealand to give you some real ideas. These are the hotels I stayed at during my two weeks in New Zealand, so you’re getting the straight stuff. Each selection varies – if you must have a huge plasma screen in your room, some of these won’t make you happy. But at all points of the price spectrum, they were great deals, especially with the U.S. dollar stacking up so strong against the New Zealand dollar. In fact, I will say that you will not find hotels anywhere near this nice for an equivalent price in the U.S., not even in the bleakest depths of the off-seasons. – I had originally booked a room at the Parnell Inn. Shortly before our trip, I got an e-mail from the Parnell Inn staff saying they’d overbooked. Rather than leaving us on our own, they arranged a similar room at the nearby Parnell City Lodge. Rather nice of them, really. Our flight from Los Angeles arrived at 6 a.m., which put us at the Parnell City Lodge way before check-in time. But the staff provided us a safe place to stash our bags while we wandered the city. The office may look a bit run-down, but the rest of the hotel is in top shape. It was clean, comfortable and really close to the LINK bus line (look for the bright green bus) that runs in a loop throughout the area, including stops at the Britomart transportation hub and close to the Sky City bus terminal, which we’d need the next day to get to Rotorua. Parnell is also a really nice neighborhood, with lots of great restaurants and a very nice park area nearby. It’s a 20-minute walk to the water. If you balk at that, just grab the LINK bus for a 5-minute ride to Britomart – that puts you near the water, where you can grab a ferry out to Rangitoto or other surrounding islands for a bit of fun. About $90 NZ per night. Ann’s Volcanic Rotorua Motel and Serviced Apartments – This is a really friendly and well-kept hotel a bit off Rotorua’s main drag. It’s very quiet, and the staff seems to be composed strictly of Ann and her family. Son Luke check us into a very comfortable and well-equipped room that included a small fridge, a kitchen sink and utensils. He also made a few recommendations on where to go and what to do. The rooms are bright and airy, and you’re not constantly hearing your next door neighbor’s TV. It’s a very short walk to a grocery store and some local pubs. Walkers like me are well within range of the downtown area, the lake and the free and very awesome Kairua Park, a thermal area right in the middle of town. Cat lovers will enjoy meeting Stripes, Luke’s cat. Bonus! The Budget Studio was $99 NZ per night. Skotel – Staying at the Skotel was not in our plans. We were hoping to be able to rent some camping gear in Whakapapa. D’oh! There’s almost nothing in Whakapapa Village – certainly not an outdoor store. 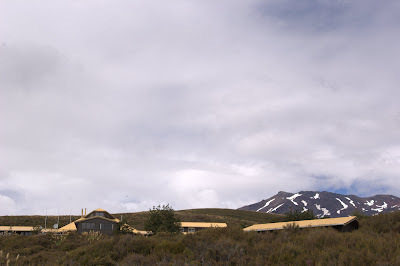 So we were ill-equipped to stay at the huts in Tongariro National Park. We scooted to the Skotel Alpine Resort, which only had a few backpacker rooms left. That means – cue ominous music – shared bathrooms! But no worries here – those shared bathrooms are modern and immaculate. The rooms themselves? 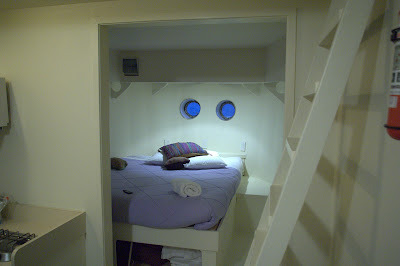 Ours was a cozy job with a homey wood interior and a trio of beds, two in bunk configuration. And odd configuration for a married couple, but what can you do? Bottom line? Warm (a big plus in Tongariro National Park, which turns into a ski area in winter), quiet and comfortable. If you didn’t bring a computer, there’s also reasonably priced Internet access. If you thought to do some grocery shopping in Taupo, there’s a well-equipped kitchen. Or you can opt for the excellent Skotel restaurant – try the pan-fried blue nose if it’s available. The price? Get this … $49 NZ for two people. Seriously, anyplace at that price in the United States is going to come surrounded by crack houses and infested with cockroaches, not wrapped in the scenery of Middle Earth. Woodlyn Park – I decided to splurge at Woodlyn Park for about $160 NZ a night. What kind of room does that get you? 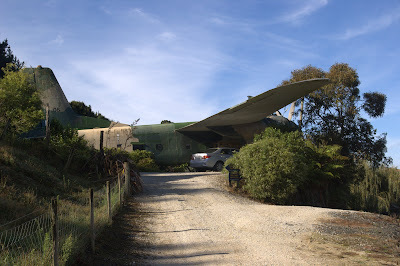 Well, in this case, a 1950s-vintage British Bristol cargo plane that’s been turned into a two-room hotel block; each room has a bathroom, two beds (at least) and a kitchenette. We were assigned to the cockpit. It can get chilly in Waitomo at night, so host Billy Black provided a space heater that keeps things warm. You can hear the crickets chirping all night, and an incredible display of stars that comes with being out in the Wop-Wops (one of my favorite Kiwi-isms). The interior and exterior of the airplane give your stay an unforgettable vibe. Woodlyn Park has also converted a small ship and a railroad car into hotel rooms, and built their own reproduction of Hobbit houses. Come for the glowworm cave tours, stay for the killer rooms! Woodlyn Park is about a half-mile from a crazy place where you can watch the staff shear an Angora rabbit. If you stumble a little further, you’re at the upbeat and lively Curly’s Bar. Comfort Inn Wellington – The Comfort Inn Elliott’s Paraparaumu puts you square in the heart of Wellington. You’re steps from the quay, the fun Te Papa Museum and, of course, the Cuba District. All this fun and frivolity come at a price: noise. If you’re there on the weekend, you’re going to hear a lot of merriment and revelry. City dwellers might not notice – those used to some quiet at night might get irritated. Still, the rooms are in good shape, if a bit dark. And you won’t lack for restaurant options – try the Rasa Malaysian & South Indian Restaurant across the street. There’s also a lot of shopping to do here. The hotel used to be a backpacker hostel, but it’s in great shape. And it’s really kind of old-school grand, especially the huge wooden staircase. $80 to $120 NZ. Cedar Grove Motor Lodge – In the U.S., motor lodge is code for a run-down old shack that hit its peak in 1963. Not here. Cedar Grove Motor Lodge can definitely make a case as one of the nicest hotels we visited. A well-equipped kitchenette, a flat-screen TV and a standout bathroom along with a very helpful staff. It was also quiet and modern. If you’re a runner, lace up your shoes and take a run on the path along the nearby river. If I had someplace like that to train, I’d be twice the runner I am. When you’re done, make the short stroll into town and grab some Indian food or a kebab at Falafel Gourmet. Everything is very close to Woodlyn Park, but Nelson is too small to have the hurly-burly of Wellington. Chateau Franz – I was a bit worried rolling into Chateau Franz: Sir Cedrics – BBH. It’s just not in the best shape. The walls are thin, and things are a bit worn down. It’s also a backpackers place, which can equal a lot of noise. But guess what? The shower is an absolute monster, and the rooms are actually warm and clean. The backpackers here weren’t a wild lot – probably too focused on getting up early for the all-day glacier tours rather than dropping X and raving all night. There’s also a well-equipped kitchen, which is a terrific way to meet other travelers. There’s a very warm vibe here, and that counts for a lot. If I visit in winter, I may choose a more solidly built place to keep the chill out. But in summer, I’ll come back. One other thing – there’s a clothing-optional spa. Nudge, nudge, wink, wink – say no more! $60 NZ per night, backpacker room with ensuite bathroom. A-Line Hotel – As I’m rating hotels, the A-Line Hotel in Queenstownand Cedar Lodge will probably slug it out for the absolute nicest rooms of our visit. 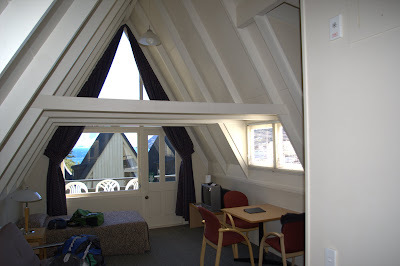 Again, we got a nicely equipped kitchenette and a top-notch bathroom, along with a phenomenal view of Lake Wakatipu and the amazing Remarkables Mountain Range that will blow you away, no matter how many times you see it. Some might find walking up and down the hill into town a bit of work – but those people shouldn’t shy away from it. Harden up, as your Kiwi hosts will say! It’s also very close to the chairlift that leads to street luge, bungee jumping and paragliding. Lots of great restaurants -Halo, Agyss Shack, Patagonia and Dux de Lux, to name a few- are an easy walk away. You may also get an audience with Oscar, the A-Line’s official cat-at-large. 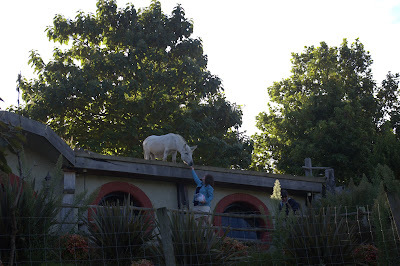 Seriously, how can a place lorded over by a big friendly cat be anything but awesome? (I’m always rating hotels with pets higher than the rest.) About $100 NZ per night. Thanks for this post. It is really helpful. Parnell Lodge is so near to our place. We should have met. For some reason, it never sank into my mind that you lived in Auckland. Well … next time (and yes, I’m hoping for a next time soon).